Time pressure is a versatile method of dispensing a wide range of material viscosities. Time pressure dispensing applys pressure pulses to a syringe. These timed pressure pulses are monitored by system software and a pressure controller. Integrate the Time Pressure Liquid Dispensing Pump into a fully automated Liquid Dispense Systems or a compact Benchtop equipment. 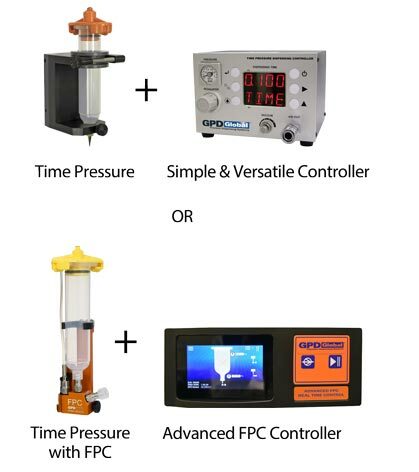 Monitor your Time Pressure Dispensing Pump with either a simple & versatile controller or an advanced FPC controller. 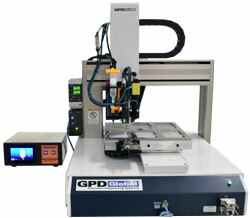 Time Pressure Liquid Dispensing Pump on Benchtop Dispenser and automated platform environments. 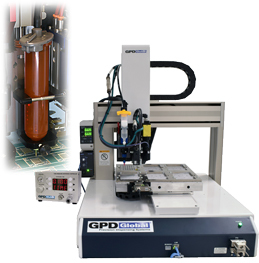 The amount of pressure used for a timed pressure process is determined by the relationship between the material being dispensed and the application flow rate. 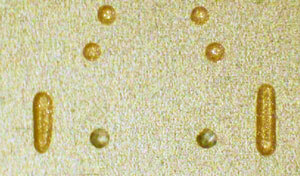 Dots 0.011" (0.27 mm) of structural and electrical conductive adhesives dispensed by Time Pressure Liquid Dispensing Pump. When dispensing is finished, adjustable vacuum prevents syringe material from dripping. Adjustable vacuum prevents air from being pulled into the needle. Time Pressure Liquid Dispensing prevents material drool when the pump is inactive by maintaining a proper level of vacuum to the syringe. This is especially useful when using low viscosity materials. Simple. Disposable. Time Pressure Dispensing. Use syringe sizes from 5 cc to 30 cc with the included syringe kit. An optional level detect is available. Cleanup is simple. All wetted parts are disposable. An operator can change the syringe and needle plus re-calibrate the system within two (2) minutes. Because material is dispensed directly from the syringe, empty syringes can be discarded. Commonly used Luer-Lok® type needles are also disposable. Consistent fluid flow to ensure accurate dispense result. User determines the dispense pressure set points and can program process pauses. Programmable Controller accommodates up to 30 programs. For more FPC advantages, refer to Real Time Process Control with FPC, and watch solder mask dispensed via Time Pressure syringe and Real Time Process Control with FPC. Time Pressure Dispensing Pump with Real Time Control (FPC) on Catalina benchtop robot.